ZTE has launched yet another smartphone called ZTE Blade V8 Pro. It has a 5.5 inches screen display with Corning Gorilla Glass 3 protection. It has support for 4G LTE network, there's a fingerprint scanner located at the front. Packs a 3GB RAM + 32GB internal memory and runs on Android 6.0 Marshmallow. Have a look at the full specs below. Price EUR 270, which is roughly 290 in USD. 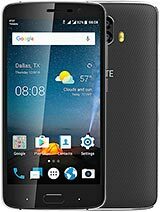 ZTE Blade V8 Pro Full Specifications, Features and Price in Nigeria, US, Ghana, India, Kenya and China. It has a 5.5 inches screen display with Corning Gorilla Glass 3 protection.